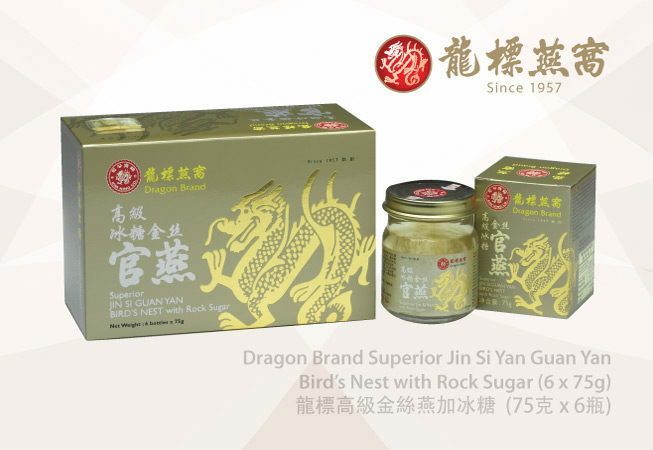 Dragon Brand Jin Si Guan Yan products are made with top quality “Jin Si” bird’s nest. They are more supple and longer stranded compared to “cave nest” type bird’s nest bottle products. This variant combines luxurious Jin Si bird’s nest and rock sugar, in a convenient six single serve gift package. Dragon Brand products are hermetically sealed with vacuum technology and hygienically sterilised by heat treatment process. No artificial preservatives, colouring or flavouring is added. The original flavours and nutrients of the traditionally prepared bird’s nests are also retained.